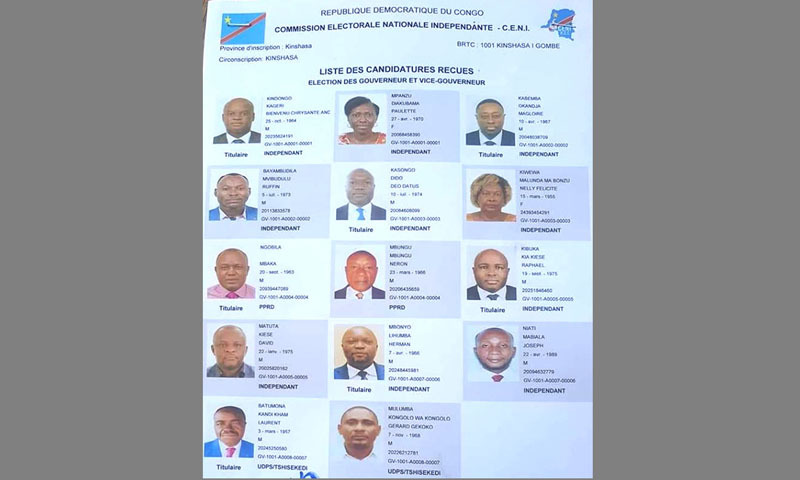 Kinshasa 08-02-2019 Politics - A total of 14 candidatures were examined, processed and retained in accordance with the electoral law to succeed the Kimbuta-Bafiba duo at the head of the city-province of Kinshasa. Bienvenu Christian Kikongo (ANC), Magloire Kabemba (Independent), Deo Kasongo (Independent), Gentiny Ngobila (PPRD), Raphael Kibuka (Independent), Herman Mbonyo (Independent), Laurent Batumona (UDPS / Tshisekedi) stand for Governors candidates, Paulette Panzu ( Independent), Ruffin Bayamilola (Independent), Nelly Félicité Kwewa (Independent), Néron Mbungu (PPRD), David Matuta (Independent), Joseph Mabiala (Independent) and Gérard Mulumba (UDPS / Tshisekedi) as vice-governors candidates. Kinshasa will know, on March 27, its new governor and vice-governor after the vote within the provincial assembly. A total of 14 candidatures were examined, processed and retained in accordance with the electoral law to succeed the Kimbuta-Bafiba duo. The PPRD and the UDPS, two proportionally majority parties in the provincial assembly of the city, are highly interested in this strategic position of the Kinshasa governorate. For the staffs of political parties managing the capital generates political advantages, so many important for this new term that begins with the advent of a new Head of State- As to say that the fight is bitter between the various candidates who jostle at the gate. The UDPS, crowned by its victory in the presidential election, does not intend to stop in such a good way. This party proposes Laurent Batumona, national of the former Bandundu, to the post of governor with for plotter Gerard Mulumba, a national of Kasaï whose election in Limete as provincial deputy can not suffer from any contestation.